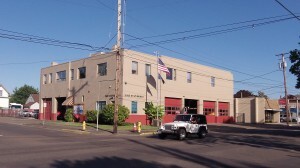 The city of Albany will need additional land if it wants to expand the site of Fire Station 11 downtown. It’s a mystery why the legislature and many Oregon governing boards still insist that the public can be kept in the dark when governments are considering spending money to buy real estate. The Albany City Council, for instance, has scheduled another executive session closed to the public for Wednesday night. The purpose: “To discuss real property negotiations,” most likely — although I don’t know this — related to the proposal to rebuild the downtown fire station and expand its site. For allowing governments to be less than transparent on real estate deals while they are being made, the usual justification is to protect the public from being held up on the issue of price. This makes little sense because if the public body needs land for a public purpose and can’t agree with the owner on price, it can take the property under eminent domain and let a jury determine how much it must pay. Real estate issues may involve important policy decisions. Should a new road be expanded here or not? Should the fire station be built at this spot or somewhere else? Why should members of the public be kept ignorant that their elected officials are deliberating questions such as these? From Councilman Rich Kellum, via Facebook: I wonder how people would feel if we had negotiations in public and then had a sellers raise the price because they knew it was the city and we had to have the property. There are very few things that should be in private; this is one of them. Another would be labor talks, others include things like legal activities, employee evaluations, although the city manager chose to have his in public. We bend over backwards to make sure we do not violate this, I cannot invite more than two other councilors to dinner.. . to talk about the Beavers’ chances this year — the price we pay. From Chuck Leland: I agree with Rich Kellum regarding open vs. closed meetings. There are just some things that need to be done without the public looking over their shoulders. Real estate purchases is one of those needing confidential treatment to get a fair price.